Chang, Art, 10 Deeply Personal Reasons Why I’m Voting “Yes” For a New York State Constitutional Convention, Sanctuary State, November 7, 2017. Brokaw, Josh, Why You Should Vote Yes For A New York Constitutional Convention, Truthsayers, October 31, 2017. Statement of Professors of Constitutional Law and Government On a New York Constitutional Convention, Scribd, October 30, 2017. Chang, Art, What do you do when “NO” flyers scream at your “YES” yard sign?, Medium, October 25, 2017. +Wilson, Jennifer, The Opportunity of a New York Constitutional Convention, Powher New York, October 24, 2017. *+Salazar, Memo, To Be, or Not to Be: New York’s Constitutional Convention Question, Medium, October 18, 2017. Schwartz, Arthur, Why Vote ‘Yes’ for a Constitutional Convention?, West View News, October 8, 2017. Chang, Art, Why has the “No” vote for New York’s constitutional convention adopted Steve Bannon’s playbook?, Medium, Oct. 6, 2017. Benjamin, Gerald, Why New Yorkers Should Vote ‘Yes’: It Comes Down to Trusting or Fearing Democracy, Urban Matters, October 4, 2017. *Brodsky, Richard, A Constitutional Agenda for the Protection and Expansion of the Rights and Liberties of the People of New York, Rockefeller Institute Blog, September 20, 2017. Shayne, Jesse, New York Has a Chance to End Political Corruption Once and For All, Electoral Reform, September 8, 2017. Heppard, Tyrone, “Anti-corruption” Group Urges NY Voters NOT to Fight Corruption, Truth Against the Machine, August 24, 2017. See also his video blog post. Schulz, Bob, Understanding the 2017 NY Constitutional Convention Question, Hey New York State, August 20, 2017. Galie, Peter and Christopher Bopst, When Rhetoric Attempts to Trump Reality: Why A Constitutional Convention Would Not Take Away Public Employee Rights, Rockefeller Institute Blog, August 9, 2017. Galie, Peter and Christopher Bopst, A $300M Error: When a Mistake Became an Alternative Fact to Oppose a Constitutional Convention, Rockefeller Institute Blog, July 11, 2017. Galie, Peter and Christopher Bopst, Why We Need a Constitutional Convention, The Public, June 28, 2017. Galie, Peter and Christopher Bopst, Not the “Same Old Same Old Politics as Usual”: Why Insiders Won’t Dominate a Constitutional Convention, Rockefeller Institute Blog, June 16, 2017. Braver, Joshua, New York Isn’t Ready for a Constitutional Convention, Dissent, November 6, 2017. Flanagan, Michael, In New York, Nobody Expects A Bloody Constitutional Convention by Dr. Michael Flanagan, Badass Teachers Association, November 2, 2017. Vote No On Prop. 1: Constitutional Convention, CNY Solidarity Coalition, October 31, 2017. Young, Brian, Using Social Media to Defeat the Con Con, UComm Blog, October 11, 2017. Steinberg, James M., Why A Constitutional Convention In New York Will Be Too Expensive, LaborPress, October 5, 2017. Scharff, Karen, Why New Yorkers Should Vote ‘No’: Basic Rights Could Be Put at Risk, Urban Matters, October 4, 2017. Statement of Agudath Israel of America Regarding New York State Constitutional Convention, Agudath Israel of America, October 4, 2017. Martins, Jack, Jack Martins Does Not Support a Constitutional Convention, Jack Martins Blog, October 3, 2017. Martins is a county executive and former New York State senator. Davis, David, A Constitutional Convention would pander to special-interest groups, Long Island Tech News, August 28, 2017. Also published in Long Island Business News. Davis is a labor lawyer that specializes in representing public sector workers. Kremerer, Arthur, Sound The Alarm Bells Against A Constitutional Convention, LaborPress, August 24, 2017. Young, Brian, NY Con Con: 10 Reasons to Vote No, UCOMM Blog, July 7, 2017 (UCOMM stands for Union Communications). 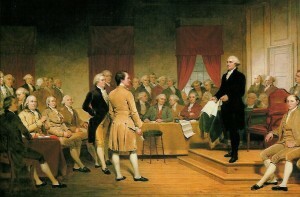 Toth, Jeremy, Against a State Constitutional Convention, The Public, Jun. 7, 2017. Toth is the former Chief of Staff to Assembly member Sam Hoyt and is currently counsel to Erie County Executive Mark Poloncarz. Rothman, David M., Municipalities and the Impact of a New York State Constitutional Convention, Harris Beach Attorneys at Law, October 31, 2017. +Hardaway, Ron, Does NYS Need a Constitutional Convention (Con Con)?, Tompkins County Progressives, September 25, 2017. Ford, Libby, Ruth Leistensnider and Lydia Warkentin, What’s trending: New York possible constitutional right to clean air and water, Now + Next, August 29, 2017. Graffeo, Victoria A., A NYS Constitutional Convention: A Quagmire of Controversy Or A Much Needed Vehicle For Reform, Harris Beach PLLC, August 15, 2017. Siracuse, David, “The Risks Outweigh the Rewards”: Who Are the Opponents of a Constitutional Convention and What Are Their Arguments?, Rockefeller Institute Blog, July 5, 2017.